Wanting to rent a rockwall indoors and not enough space to fit the 24ft 3-Climber Rockwall? 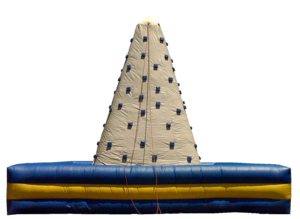 Our 24ft Inflatable Rockwall is the same size. The Rockwall is an inflatable so we can fit the unit into smaller door ways or fences so you are still able to achieve an awesome climbing experience. The unit is Human belayed unlike our auto belayed system above. Even though the unit is Human belayed it is extremely safe! The climber(s) will be hooked up to a Lakeland Moonwalk trained representative.